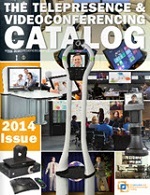 Thank You for Subscribing to Telepresence Options Magazine! All of the free print copies for 2014 have been shipped. However, you can still order hard copies with paypal, using the forms below. All prices are in USD and include full postage. Please note, each hard copy includes both the magazine and catalog, bound together in a "swiss flip". Don't forget, it isn't too late to subscribe for a FREE print edition of next year's magazine. Thank you for subscribing. Please click below to view or download the magazine (pdf) and catalog (pdf). All of the free print copies for 2013 have been shipped. However, you can still order hard copies with paypal, using the forms below. All prices are in USD and include full postage. Please use the forms below to order hard copies of the 2012 magazine with paypal. All prices are in USD and include full postage. Please use the forms below to order hard copies of the 2011 magazine and catalog with paypal. All prices are in USD and include full postage.